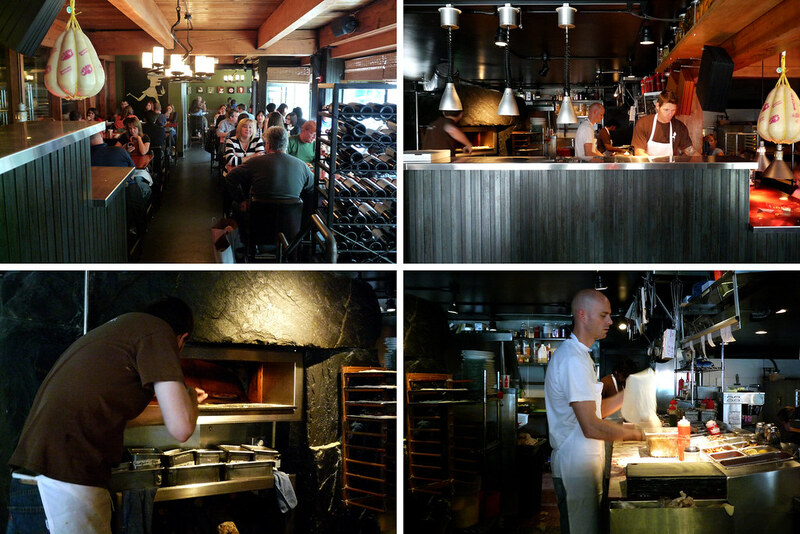 In this solo dining adventure, Gary visits Serious Pie, one of many restaurants from Seattle mega-restauranteur Tom Douglas. When asking for help from my fellow Chowhounders, many mentioned that I’d be remiss if I didn’t visit at least one Tom Douglas joint while I was out in Seattle. After all, the man has several restaurants (six by my count), all of different styles and cuisines. I narrowed my choices down to two. I was definitely tempted by Palace Kitchen and their burger, which I was told was one of the best in Seattle. Anyone who’s been following my posts on this site can probably figure out that I do have quite the burger fetish. In the end, though, I went with Serious Pie simply because they were open for lunch and Palace Kitchen was not. Serious Pie was actually the end of a fun morning in which Kate’s uncle Rod drove me around the Seattle area so I could see the things I wouldn’t have been able to see since I was sans car on this trip. [People who know me know I’m saying that tongue-in-cheek since I’m always sans car when traveling alone.] We ended up taking a more extended tour than planned, finding ourselves in a bit of a time crunch so we ended up taking our pizza to go. Probably a good thing because there was not an empty seat in the place and there were people waiting outside for a table. We ordered the chanterelle mushrooms and truffle cheese pizza, of which I ate nearly all of it since Rod actually had to get going. [Thanks for the pizza, Rod!] Anyway, back to the pizza – it’s hard for me to call it pizza from the looks of it since it’s really just some melted squares of cheese and mushrooms on top of some baked dough. That’s the New Yorker in me saying that. 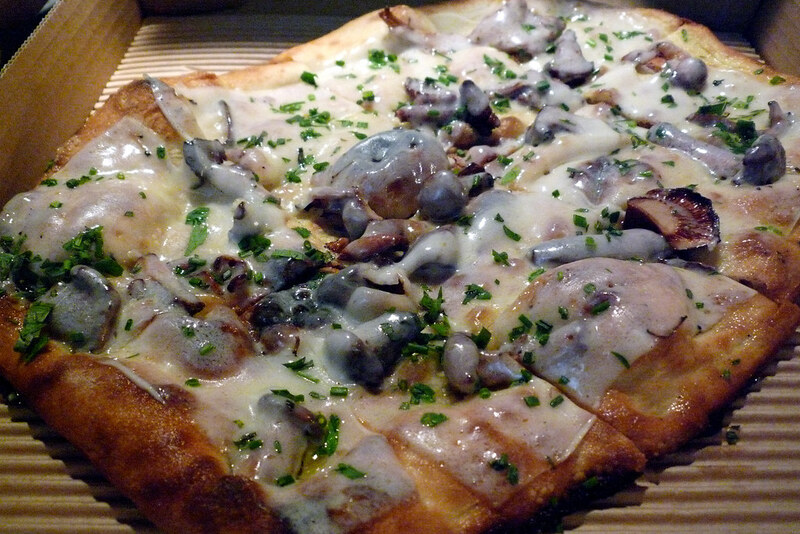 Really, though, this is a really tasty pizza – the truffle cheese has plenty of truffle flavor while the chanterelle mushrooms are really wonderful when roasted. As far as herbage goes, I think this had some tarragon on it because its flavor is pretty unmistakeable. The crust is thin and crispy around the edges but with plenty of satisfying chew in the middle. I would say it’s a little oversalted but I’m sure Kate would find the sodium level here to be just right. The folks at Serious Pie make a great pizza – one that’s a little closer to New Haven in appearance than the Neopolitan that’s exploded in popularity in recent years. It suffers a little from a heavy hand with the salt but there was so much flavor in my pie that I was willing to forgive them for that. After all, we also got some beer to go from them so I just took a swig of that and my problem was solved. Serious Pie. 316 Virginia Street, Seattle, WA 98101. [Show/Hide Map] (206) 838-7388.